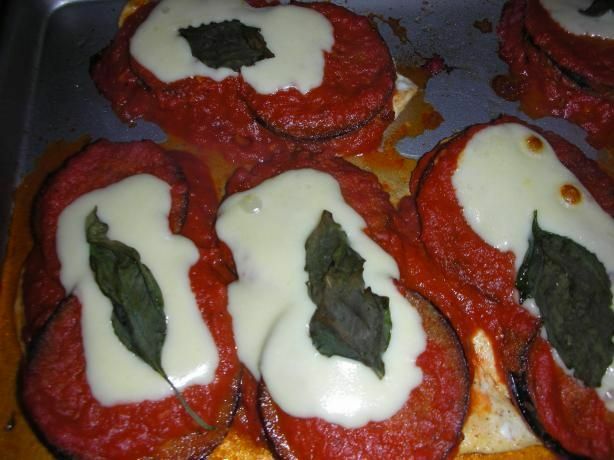 eggplant in the extra virgin olive oil until nicely browned on both sides. Drain on absorbent paper towels. begins to melt. Serve with the sauce ladled on top and a side of plain buttered pasta. remember my Mom making this dish when she got home from work. Usually she had the chicken breasts butterflied at the butchers, it was easier and slicing the eggplant was only a minutes work. No tomato sauce on the pasta, just a little butter. The sauce from the chicken will flood into the pasta and really give it a great flavor. I love this at my favorite Italian restaurant, any idea of nutritional vslue?